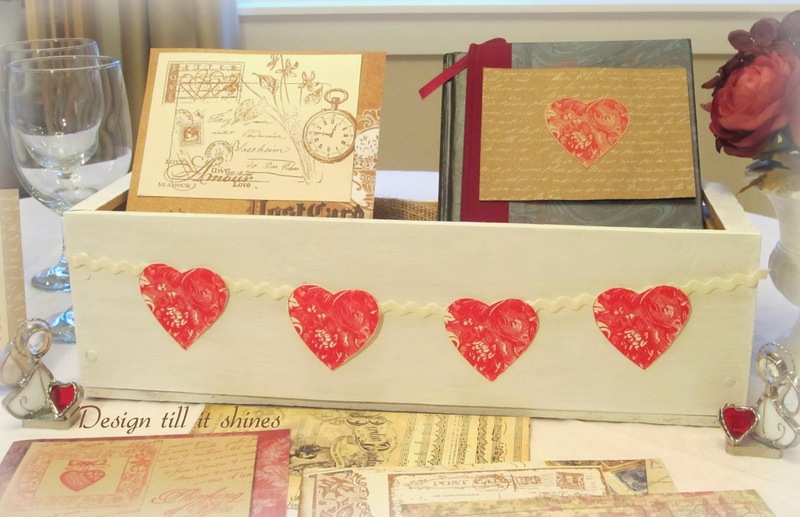 I wanted to do something special for Valentine's Day, and since it is tomorrow I knew I would have to put something together quickly and use my stamps and scrapbook paper. 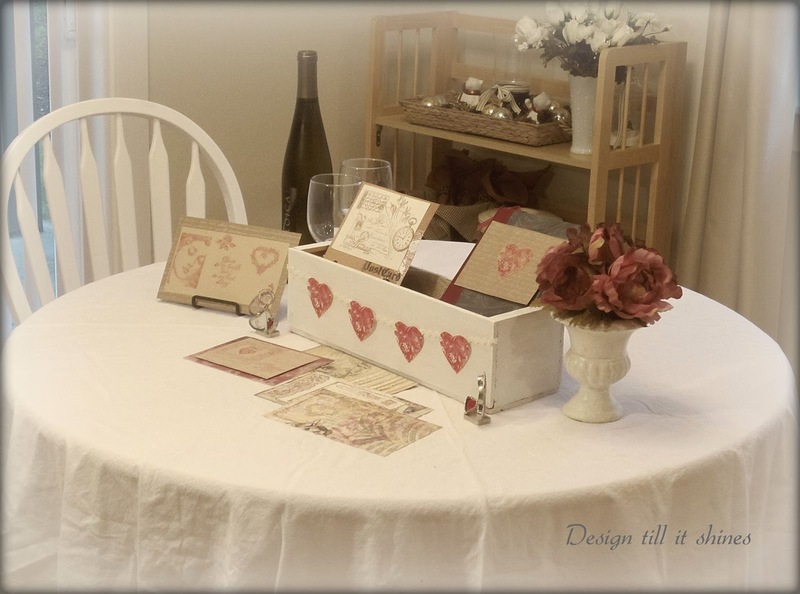 I would call this a shabby chic theme and used a round cotton tablecloth then created some romantic themed cards. I started this a few days ago, but I'm just now finishing up and even though I hate being rushed, it was fun creating valentines and putting my little valentine box together. This is just a simple little display and to fill in the space I added some wine glasses and some wine we have been saving. 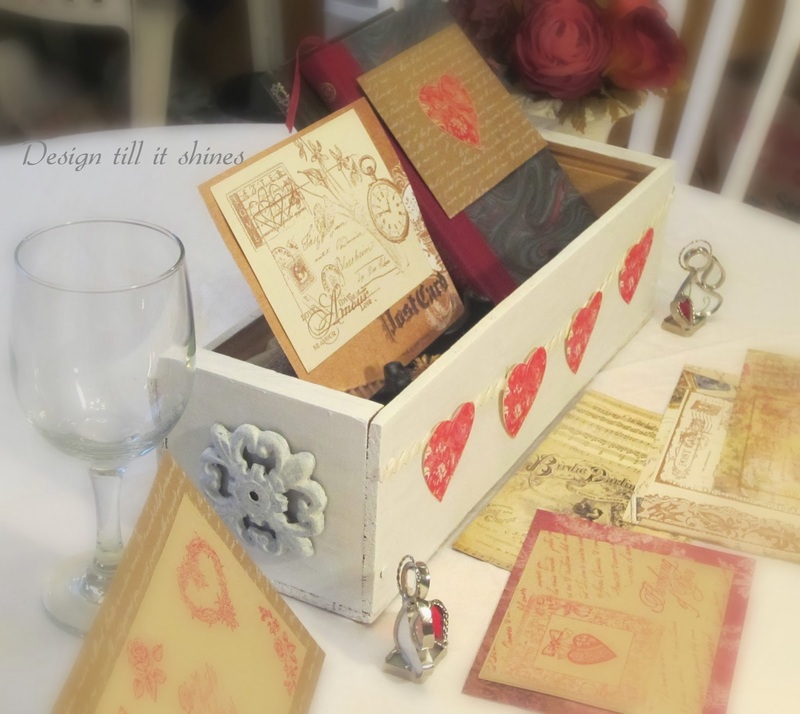 I love wood boxes so I found this wine box at a thrift store, painted it white and added a heart banner with my favorite floral heart stamp. 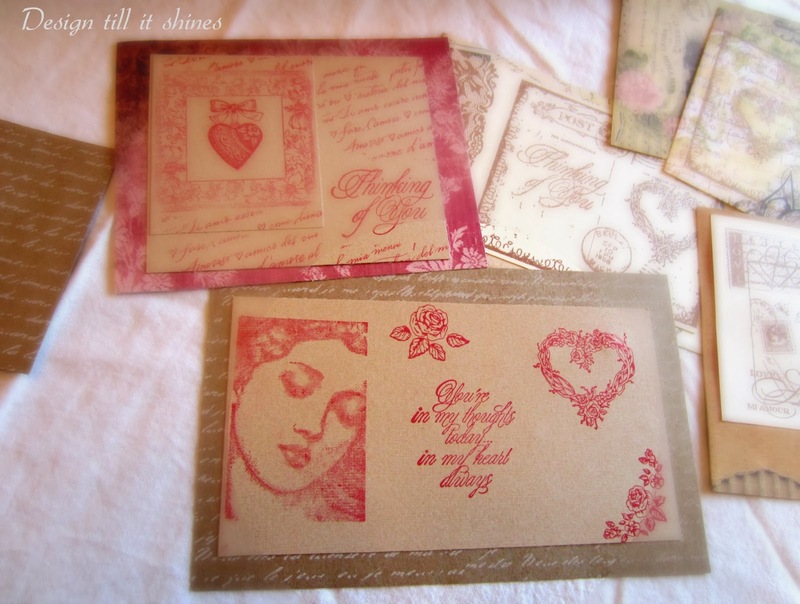 I stamped some romantic images onto card stock and layered them onto the scrapbook paper. I like "no muss no fuss" projects, and these went along fairly quickly. I do need to experiment with my camera a bit more and find better settings to take my photos.For the time being I'm relying on photo editing. A simple heart on french script paper. The wine box is fairly narrow, so I only added a decorative metal piece to one end. A few of the stamps I used. I found the cute little girl valentine stamp on clearance at a craft store over the holidays. Stamping used to be quite popular years ago when I started, now you can find some great stamps on clearance if you just know where to look. 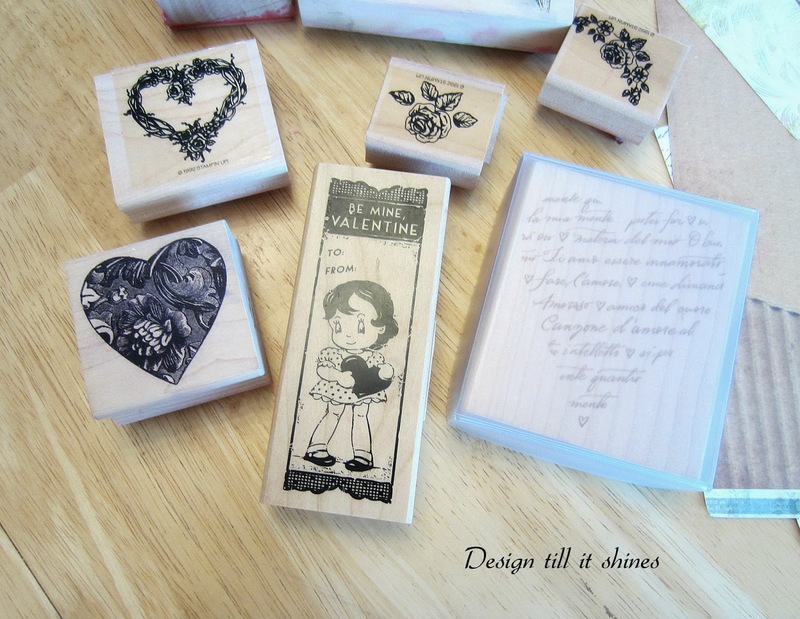 The little girl valentine stamp served as my inspiration piece and I knew I had to create something with it. I love the vintage appeal. I just wish I could have posted this sooner. At least I finished it though and have something to show for Valentine's day, although it is almost upon us! I have some pics coming up showing how I displayed her with my bears. Another favorite was this vintage scrapbook paper that looks like cardboard. 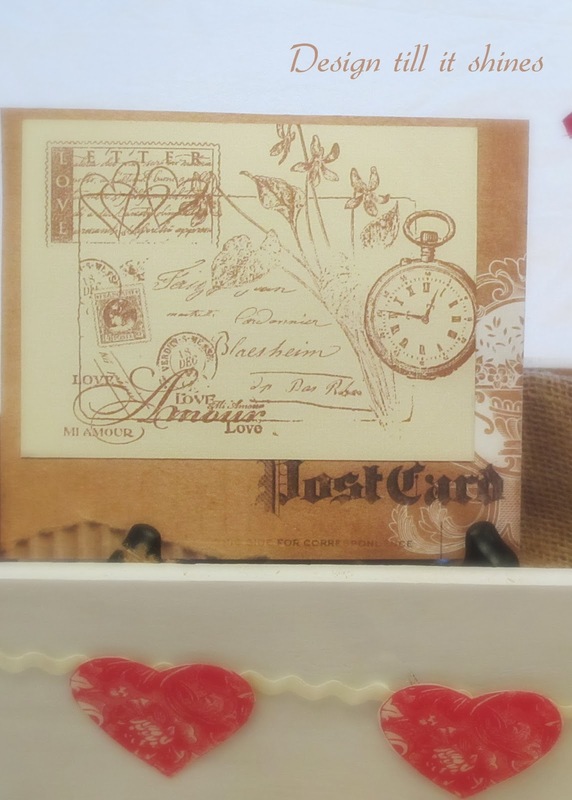 I added some stamped images to cream card stock and added it to the front. 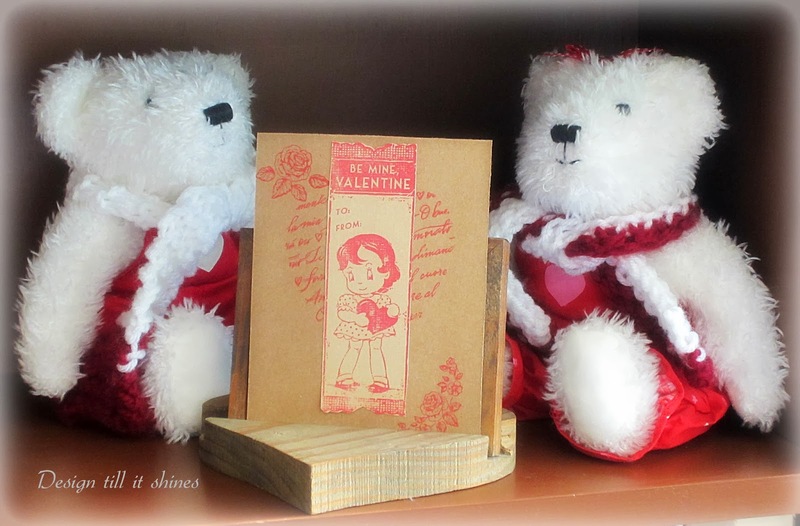 I wanted to use a pink theme for one of the cards, so I used my bright pink stamp pad and made a vintage valentine to go with my bear. I've had this bear for quite a few years. I don't think we're ever too old to hold on to a few favorite bears that we've collected. I've always liked the soft pastel pink and yellow on this bear and the flower. I knitted a cap and scarf several years ago to add to it. I used decorative things I already had to embellish the card a bit. These are my kissing Valentine bears. Their cheeks would glow when they kissed, but the battery has since worn out. 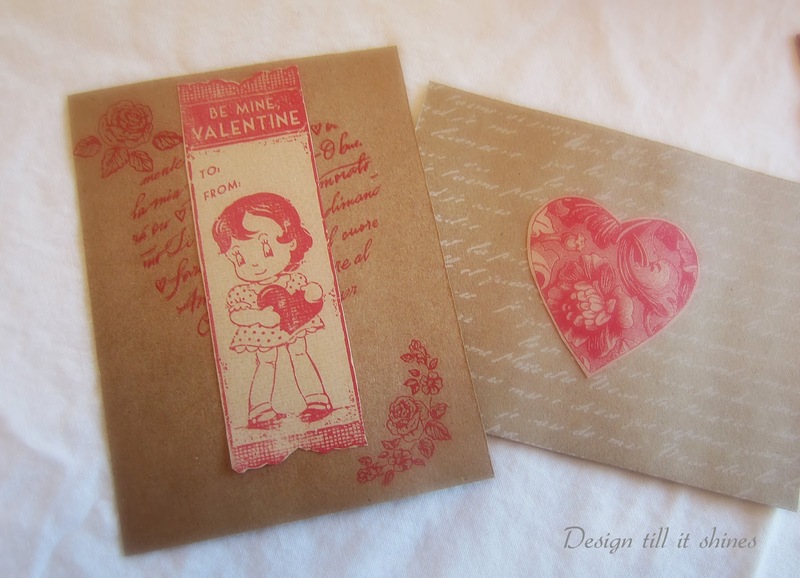 I still like them and I'm glad I kept them since they go so well with my vintage valentine. 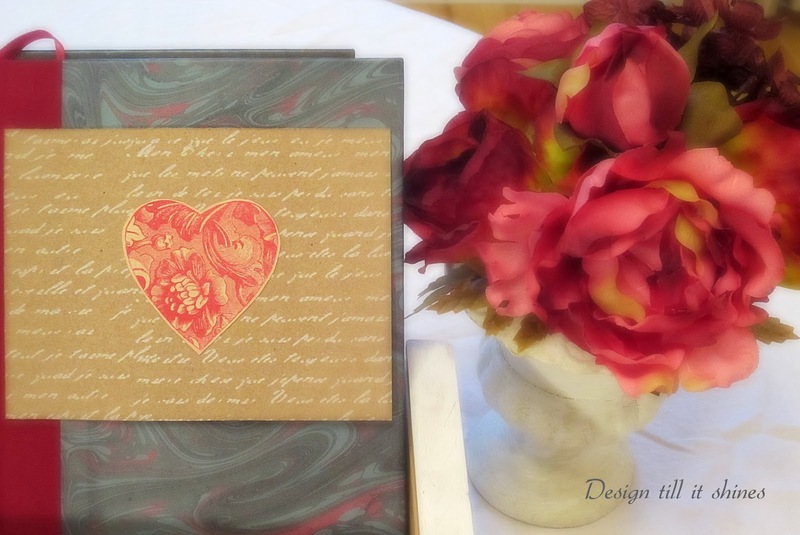 I used a heart stamp for the background and stamped the valentine girl's image adding it to the top and stamped some roses in the corners. This stamping hobby of mine has come in handy since I've started blogging. We don't have anything special planned for Valentine's day this year, partly because my hubby's birthday is a week after the holiday and we celebrate then. The wine left over from New Year's eve is tempting me though, so we can make the evening a little more special and share it. Thanks for stopping by and seeing my almost belated Valentine post. 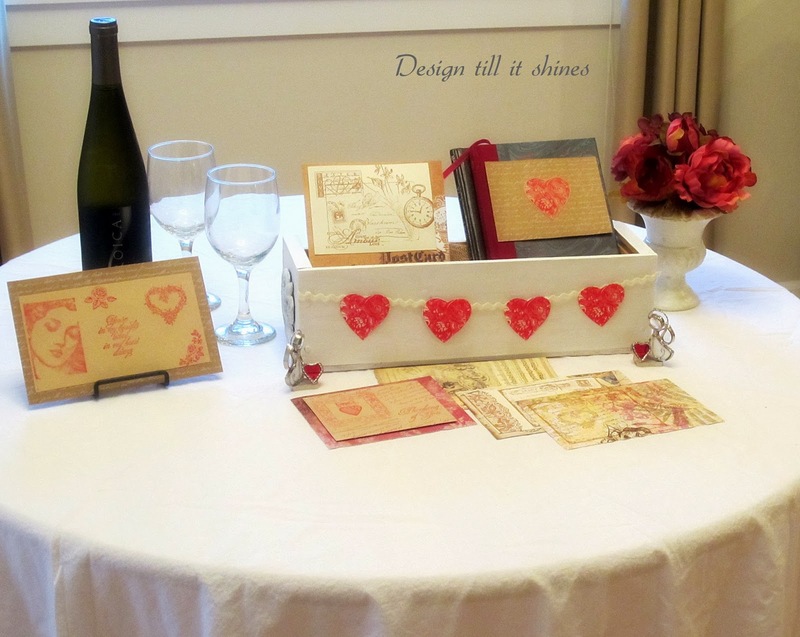 Love your Valentine vignettes!! So cute!! This vignette is so cute. Love the stamps you used and such fabulous paper! 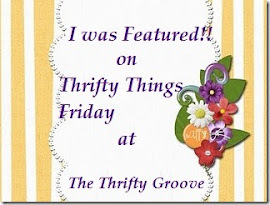 Thanks for sharing at TTF! I love the cute Valentine's vignettes. The teddies are adorable.. Happy Birthday to your hubby! Enjoy the new week ahead! 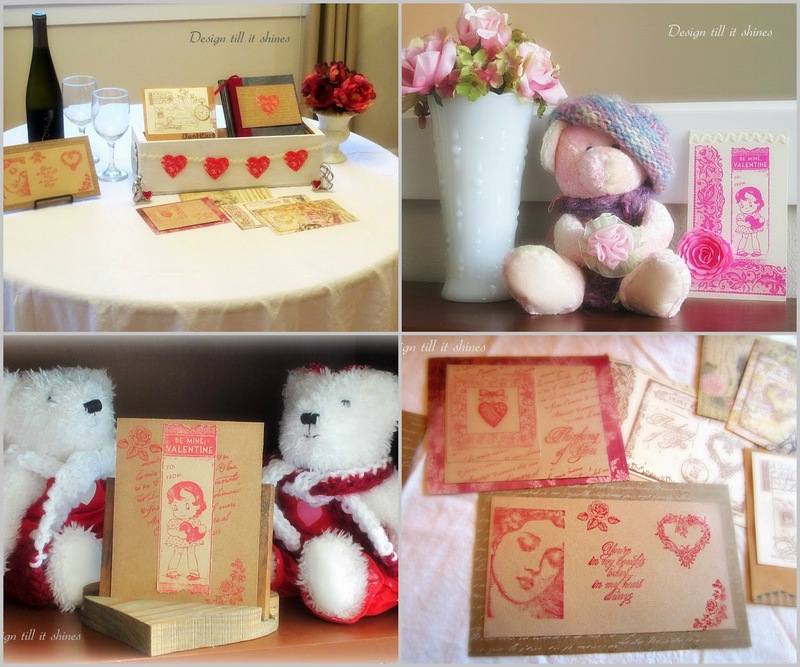 You created some cute things for your Valentine vignette. 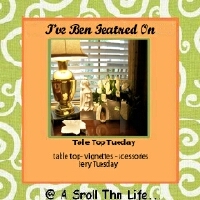 I love stamping and am always on the lookout for new stamps to make my cards. Hope you had a wonderful Valentine. My favourite is the little pink bear! Hi Diane, what a lovely vignette for Valentine's. With your husbands's birthday so close, I don't blame you for celebrating them together. 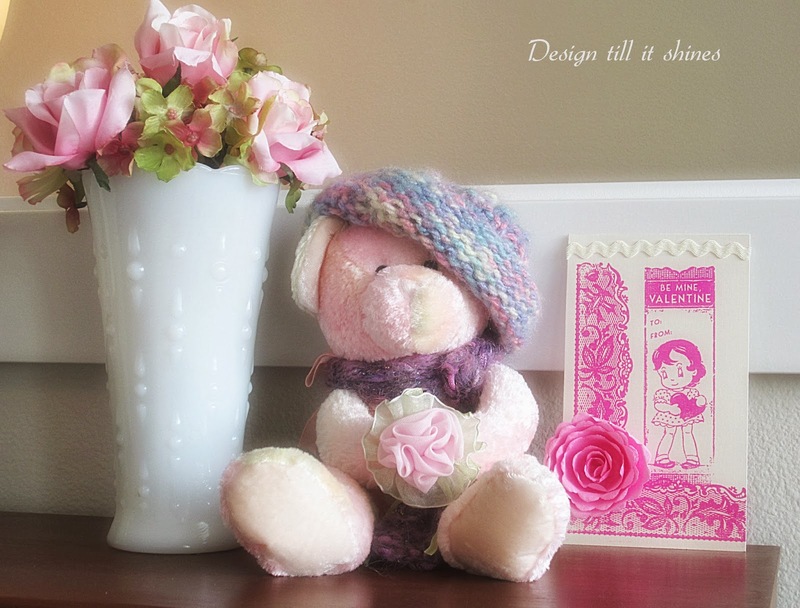 Love the pink bear. The cards are all so cute. 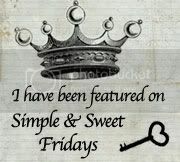 I have never stamped, so I am intrigued!. Such beautiful creations for Valentine's Day! 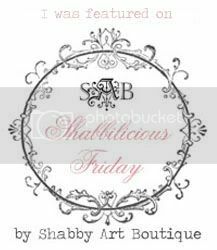 The pretty white box is my favourite for its soft and subtle feel of dainty little hearts and ribbon. 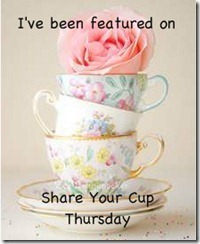 Thank you for sharing this sweet post! Love your decorations. Love the stamping. Esp. that cute little girl stamp. I have lots of bears and love to decorate with them. Glad to see someone else does as well. Diane, your cards are beautiful! You have some great stamps. I just picked up a little tote at a thrift. Planning on giving it a coat of white. Your box turned out great! Thanks for sharing with SYC.